My main reason for upgrading my fridge was due to the fact I had established a very effective Solar Install. It seemed silly not to take advantage of all of that free energy to power a compressor fridge. This type of technology is far more effective than the stock fridge at doing it’s job. 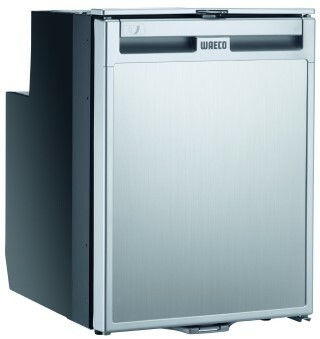 It actually has a dedicated freezer draw which is great for Ice Lollys on a hot day 😉 . Anyways, on to the installation: I wanted this to sit just below the slide out chopping board as I wanted to maximize the depth of the draw I am going to fit below it. So after some careful measurements i set to positioning a couple of pieces of angle aluminum to sit the shelf on. 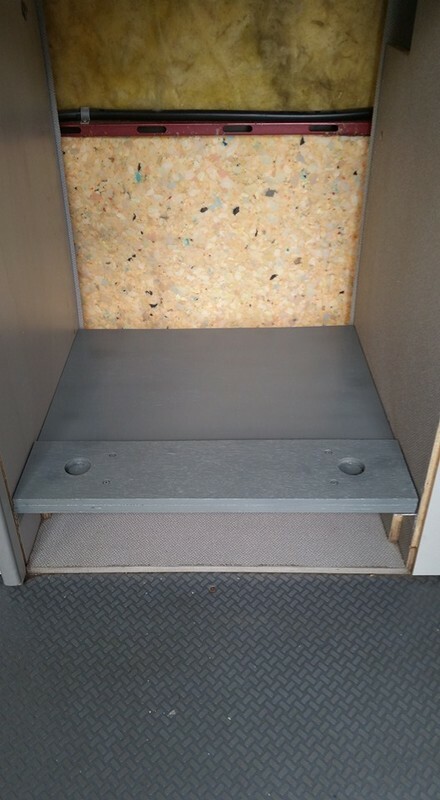 The shelf was then made by two pieces of marine ply. 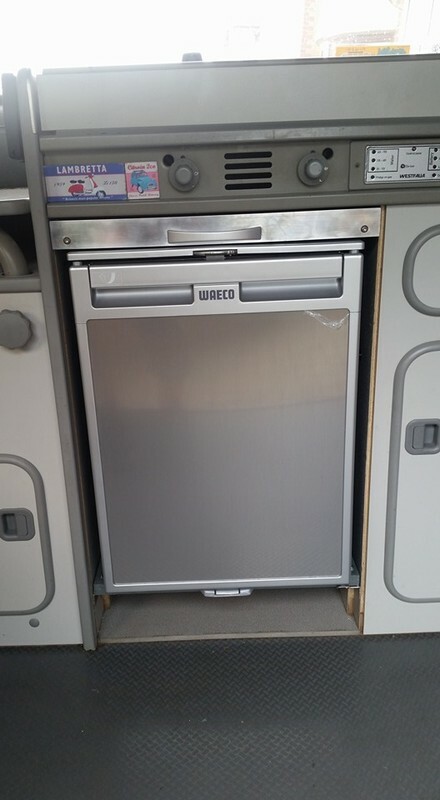 The first was the full width and depth required to seat the fridge on. The second was a slimmer piece with two holes drilled into them where the two front feet of the fridge will locate. This will stop the fridge from sliding about as there are no real fixings as such everything is having to be bespokely made. The two pieces were glued and screwed together and painted grey. After this i needed to find something that would provide padding either side of the fridge to wedge it in place. I wanted this to be something that wasn’t going to get affected by damp or humidity, but provide a nice gentle compression on either side of the fridge. After some time i decided that kneeling pads would be just the right depth to bridge the gap (the sort of thing you get for gardening). These cost me £1 each from Wilko . These were sprayed black at the front and they were screwed to the inside of the fridge compartment (two screws at the front and 1 at the back. 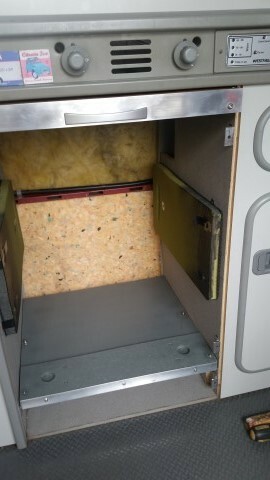 each screw head had a large washer on it to pull the padding in and I tightened the screws up enough so that they sunk in and didn’t catch the fridge when being slotted in. The heads were also covered with a piece of insulation tape to be ion the safe side. Anyways, here is the finished article after the lower draw is fitted. Hi Andy. 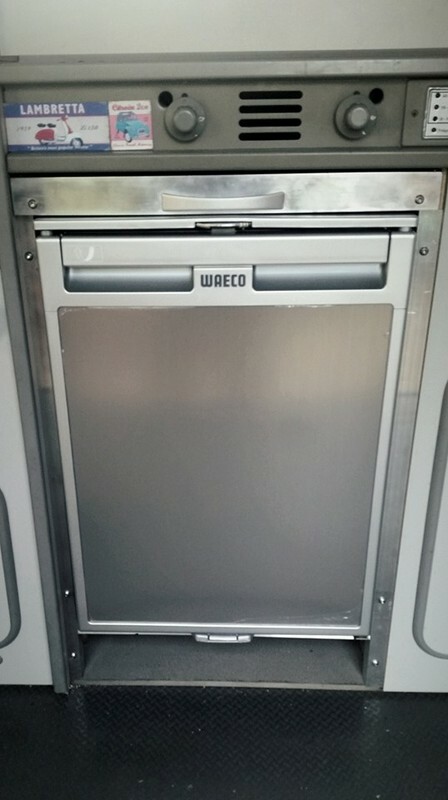 I’m thinking of swapping out the original fridge for one of these (or the CRD50) but am not keen on the way it seems to stick out when it’s fitted to the Westfalia interior. 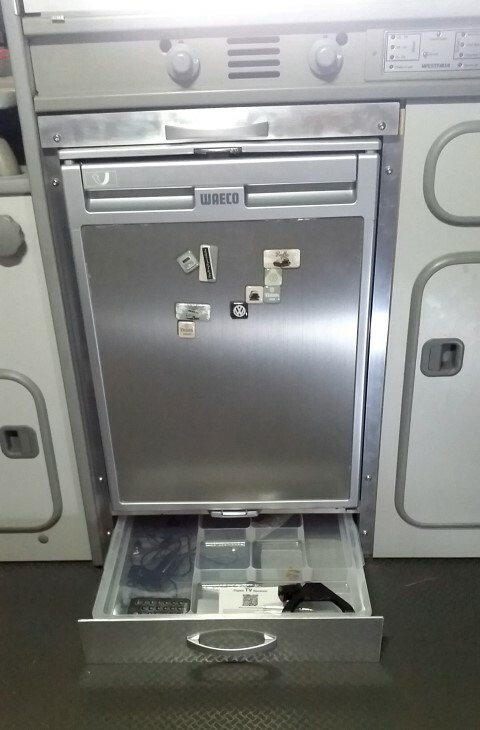 The pic above looks OK but the one in your ‘Lower Fridge Drawer’ post looks like it’s sticking out. Am I just imagining this or does it indeed ‘stick out’?